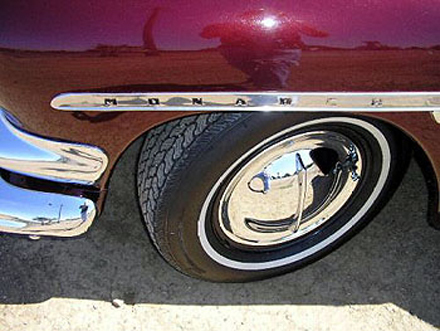 Many of us from the Northern states remember that during the 1940s, '50s, and '60s, Fords and Mercurys from Canada wore the Meteor or Monarch name plates. 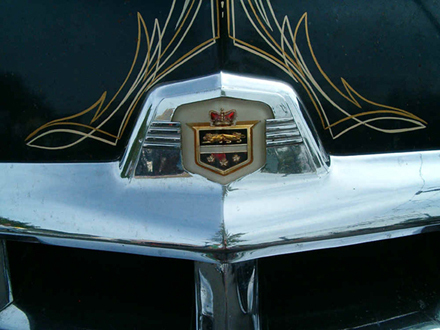 Ford trucks were also badge-engineered and sold as Mercury's. As a point of history, Ford was in business in Windsor, Ontario by 1904, a year after the Ford Motor Co. was founded on the other side of the Detroit River. 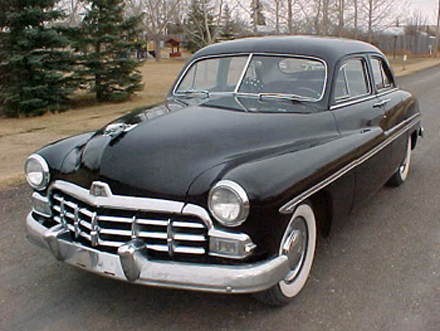 The Meteor, Monarch cars and Mercury trucks first appeared in April, 1946 because of Ford of Canada's postwar marketing strategy. More lower-priced cars were sold in Canada than in the United States because of the slightly lower standard of living, not to mention whopping sales and excise taxes that added almost 20 percent to the sticker prices across the border. 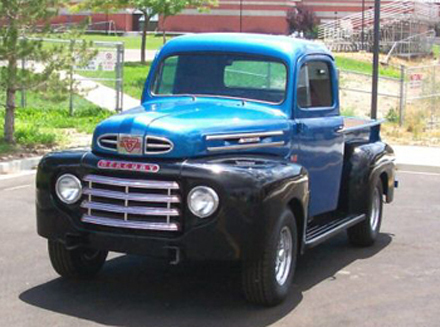 Ford's first all-new postwar vehicle was a truck and not a car. Ford trucks got all-new sheet metal for 1948. 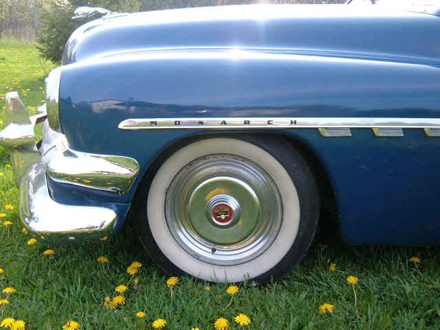 Ford, Mercury, Lincoln.... and in Canada, Meteor and Monarch.... cars were all-new for model year 1949. Canadian-made Ford and Mercury trucks differed, for the most part, only cosmetically. 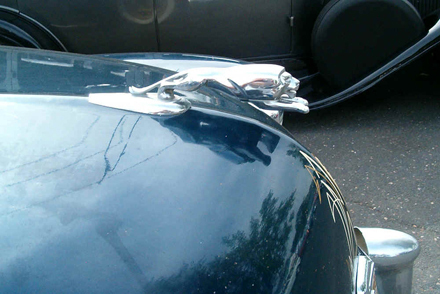 Many years it was just "Mercury" versus "Ford" letters on the hoods and pickup tailgates, plus distinctive medallions that set them apart. 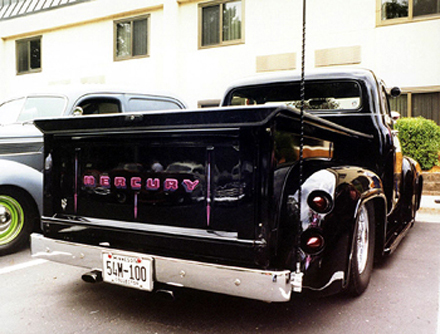 Often there was a bit more glitz on the Mercury trucks, in keeping with their slightly-more-upscale image. As far as the dash plastic molding in 48-50, only the Mercury had a kind of gray marble look, where Ford was tan in color. But occasionally there were distinctly-different grille layouts. 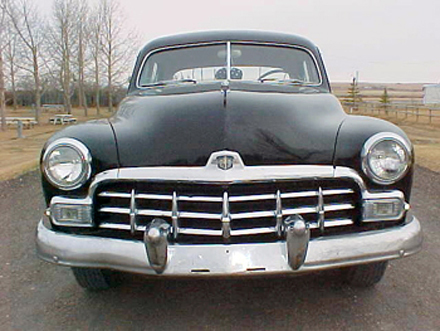 For instance, like the American-built Ford trucks, Ford of Canada's 1946-47 pickups were warmed-over pre-war models, but the Mercury trucks were treated to a heavily-chromed grille and bumper treatment, compared to the Ford's plain looks. 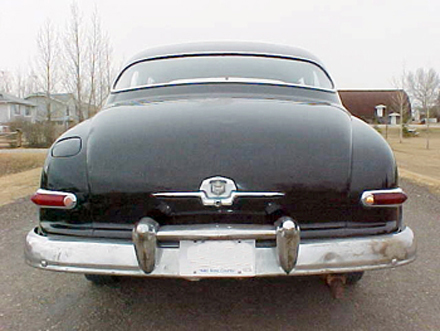 This dual marketing setup was not unique to Ford Motor Co. Pontiac dealers in Canada sold lower-priced Pontiacs that were essentially Chevrolets with Pontiac styling features. 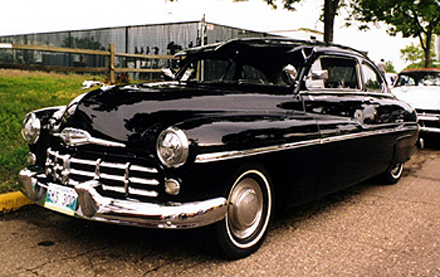 Canadian Dodge-DeSoto dealers offered a Plymouth based Dodge model and Chrysler-Plymouth dealers sold Fargo trucks that followed the cloning philosophy of the Ford-built Mercury trucks. 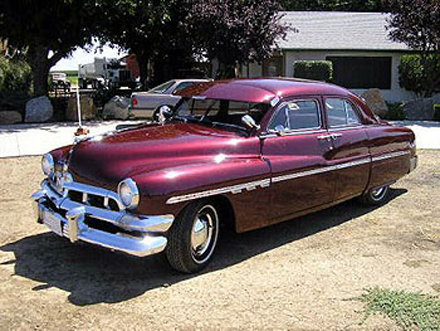 To give the Canadian Lincoln-Mercury dealers a broader range of cars that reached into the low-price market, they sold the Meteor, a Mercury-ized Ford. 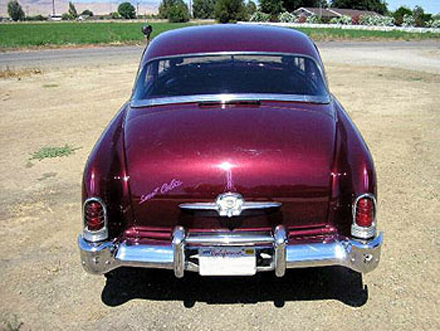 To counter any sales advantage from Lincoln-Mercury dealers' broader range, Ford dealers got the upscale Monarch, a Mercury clone. Because smaller Canadian towns had either a Ford-Monarch or Lincoln-Mercury-Meteor dealer, but not both, the L-M-M network got the Mercury truck. 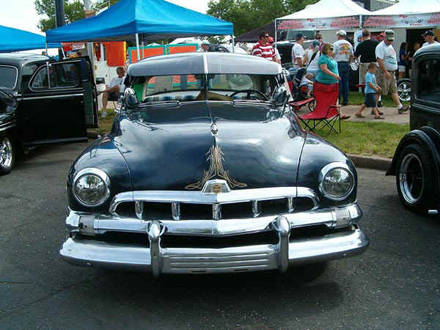 In 1948, Ford (USA) introduced the F-1, F-2, F-3, etc. truck nomenclature. Ford of Canada took a modified tact. It used an "M" for the Mercury, in the place of the "F," but the numeral stood for the truck's Gross Vehicle Weight rating, less the zeros. Thus, a Mercury M-68-designated 6800 pound GVW-corresponded to a Canadian Ford F-68. It got back in step in 1953 when Ford switched to the current F-100, F-250, F-350 numbering scheme with parallel M-100, M-250, M-350 designations for the Mercury. The mechanicals of both Canadian built truck brands were virtually identical. Because of a smaller Canadian market, (Ford of Canada roughly sold one-tenth as many trucks as its US parent). Canadian buyers had a smaller menu to choose from in terms of models, ratings and power-plants. 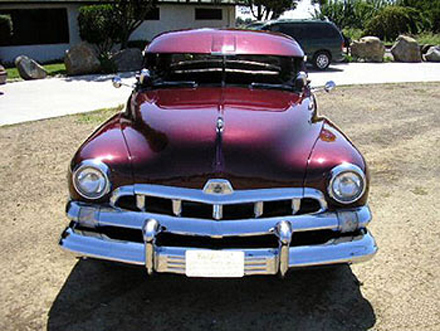 While American Fords got an all-new overhead valve V8 in 1954, the venerable flathead V8 soldiered on for another year in Canadian Fords, Meteors, and Mercury trucks. 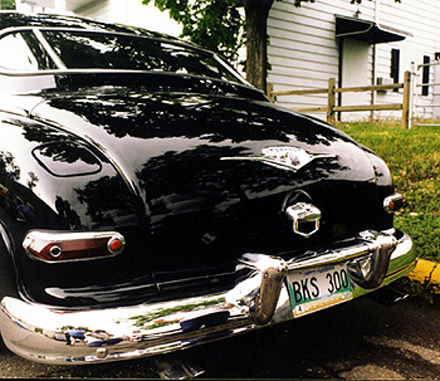 Until 1956, only V8 engines were installed in all Canadian Ford cars and trucks, since no six-cylinder Ford engines were produced in Canada until the 223- cid six appeared in 1956. The need for a dual marketing network was eliminated with the Automotive Trade Agreement signed by the United States and Canada in 1965. The free-flow across the border brought the phase-out of the Mercury trucks by March 23, 1968.